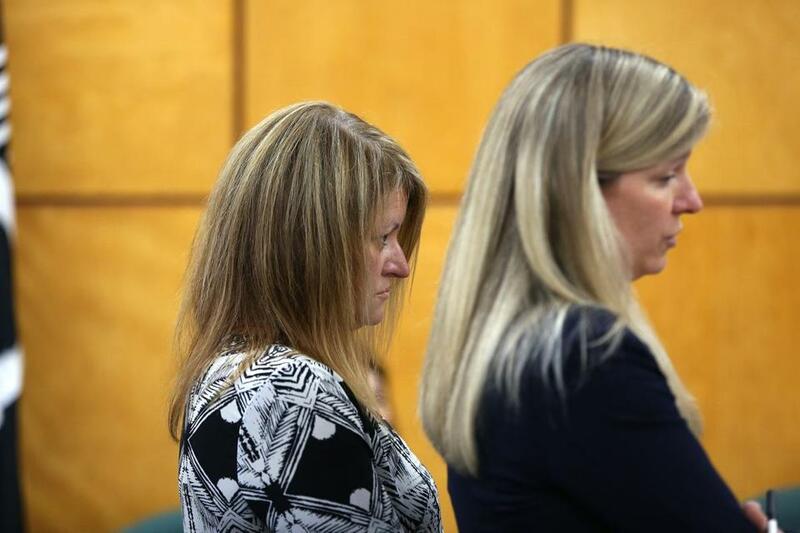 Former Massachusetts State Police payroll head Denise Ezekiel (left) appeared in court Monday. FRAMINGHAM — The former head of payroll for the Massachusetts State Police pleaded guilty Monday to a charge she stole $23,900 from the agency, officials said. Denise Ezekiel, 50, of Holbrook, was sentenced to 2½ years of probation and ordered to pay back the money she stole, though she will be allowed to pay back the vast majority of the pilfered funds by forfeiting a $17,050 lump sum payment State Police owe her for unused vacation benefits, court records show. Ezekiel was ordered to pay the remainder — $6,850 — by the end of her probation. Judge Michael Fabbri also ordered her to perform 100 hours of community service, to continue seeking employment, and to undergo a “comprehensive evaluation” within 30 days and to comply with any recommendations from that review. The judge’s sentence was somewhat harsher than what was recommended by prosecutors from Middlesex District Attorney Marian Ryan’s office. Prosecutors sought only two years of probation and restitution of the money she stole. Ryan’s office declined to comment about the sentencing. Ezekiel’s lawyer, Amanda Sheehan, had agreed to prosecutors’ sentencing recommendations. Sheehan did not respond to messages Monday. The sentence was issued in Framingham District Court after Ezekiel pleaded guilty to one count of larceny over $250. Ezekiel, a longtime state worker, held a $95,000-a-year job as a civilian supervisor with State Police overseeing a payroll of at least $290 million last year. She was placed on unpaid leave on Nov. 1, after State Police officials discovered financial discrepancies and launched an internal probe. The department filed a criminal complaint against Ezekiel on March 6. But the case did not come to light publicly until mid-April when MassLive reported her name was on a list of suspended State Police employees. State Police said in their criminal complaint that, over a 15-month span ending last October, Ezekiel deposited a total of $23,900 of department funds into a personal account, falsely claiming the payments were reimbursements for travel and training expenses. The agency has said it reviewed other payments she received since joining the State Police in 2013, and it also reviewed the payroll unit she worked in, and found no other irregularities. Ezekiel faced significant financial troubles shortly before the alleged theft began. Court records show she was sued in late 2014 and early 2015 by three credit card companies, which claimed she owed an estimated $23,000. Days before police filed the criminal complaint, Ezekiel applied to receive pension benefits with the State Retirement Board. But, as of Monday, that application had not been processed and she had not started receiving payments, officials said. Those benefits are now in jeopardy. Travis Andersen of the Globe staff contributed to this report. Matt Rocheleau can be reached at matthew.rocheleau@globe.com. Follow him on Twitter @mrochele.